Railroad Museum CEO Cheryl Marcell. Photo courtesy Sacramento Railroad Museum. SACRAMENTO, CA (MPG) – California State Railroad Museum Foundation President & CEO Cheryl Marcell has been named to serve on the prestigious board of directors for the HeritageRail Alliance, a nationwide organization dedicated to promoting the common interest of entities engaged in the business of tourist, scenic, historic or excursion railroading, railway and trolley museums. The official announcement was made at the HeritageRail conference held last week in Santa Fe, New Mexico. Marcell will serve on the board for a three-year term ending in 2021. 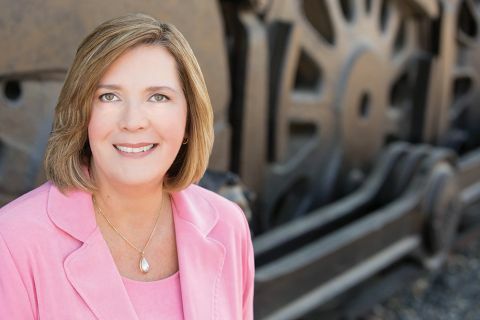 With an impressive and expansive background in business development and the airport industry, Marcell joined the California State Railroad Museum Foundation in April 2015 where she has been instrumental in helping to reinvigorate and pave exciting new paths for the California State Railroad Museum in Old Sacramento and Railtown 1897 State Historic Park in Jamestown. Marcell’s new role on the board of directors comes at an important time for the rail industry. May 2019 marks the 150th anniversary of the completion of the Transcontinental Railroad when, along with the rest of the country, the California State Railroad Museum & Foundation plan to present a series of exciting events, activities and exhibits to commemorate the historic achievement that helped to shape and connect the nation. For more information about the California State Railroad Museum Foundation, please visit www.californiarailroad.museumand for information the HeritageRail Alliance, please visit www.atrrm.org.